This Peugeot 308 is available in Silver, Black, White, Red, Blue other colours and lease options, subject to availability and includes a warranty. The Peugeot 308 with 8 engines to choose from - it's the tallest family hatch of all and makes a fantastic family hatch back with great specifications and stunning modern looks. Space is the theme, with lots of headroom, cabin and boot storage opportunities and the driver has great visibility from its large windscreen. Comes either as a manual or automatic, petrol and diesel engines. Which Peugeot 308 are your going to lease today? We offer top quality Peugeot 308 from brand new, nearly new, slightly used or ex demo, whether you have good or poor credit rating, pay a low or no deposit. These Peugeot 308 can be leased or financed and come with a warranty, HPI checked and when contract hire leasing, include UK nationwide delivery and AA or RAC Roadside Assistance cover for peace of mind. 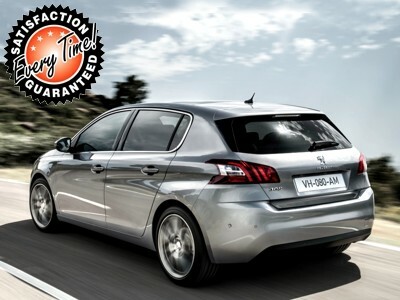 Time4Leasing can offer you the latest Peugeot 308 lease deals at lower prices because these vehicles are exclusive and offered at lower rates to customers that have good, poor or even bad credit history score ratings. There are eight engines to choose from in the Peugeot 308 range, providing performance that ranges from sufficient to searing. We reckon the sweet point in the range is the 110bhp diesel, which is flexible and smooth, and gives really impressive fuel economy and emissions. There are six trims to choose from, too. Access models have air-conditioning, four powered windows and a CD player, but we reckon it’s worth upgrading to Active trim for its cruise control, alloys, automatic lights and wipers and Bluetooth. Allure models add part-leather seats, climate control, parking sensors and a panoramic roof. The GT model, which is only available with the 197bhp petrol engine, also has sportier styling. The ultra-effficient Oxygo model has similar equipment levels to Active trim, to which it adds all sorts of extra energy-saving gubbins. The fleet-specific SR trim is also similar to Active, but with sat-nav thrown in. What do you get when you lease an EX DEMO PEUGEOT 308? This is an exceptional offer and the vehicle is as new. This example of this fantastic family hatch back with great specifications and stunning modern looks comes with Satellite Navigation, Bluetooth Prep, Air Conditioning, Electric Windows/Mirrors, Remote Locking, 16" 7 Spoke Alloy Wheels, Front Fogs, Finger Tip CD System With USB Input, Front Centre Armrest, On Board Fuel Computer, ESP Control, White Dials, Rear Headrests, Fully Colour Coded, Balance Of Manufactures 3 Year Warranty, Outstanding Value For Money And Very Low Running Costs Including £20 Per Year Road Tax And Very Economical. There are 43 Peugeot 308 Lease Deals on Offer.